Hit the streets of the colonial center on a Guanajuato city walking tour of nighttime drinking spots and the food stalls that only come out in the dark. From the company that’s been showing off the best of the city for more than five years! Tour runs three to four hours, usually starting at 7:00 p.m. 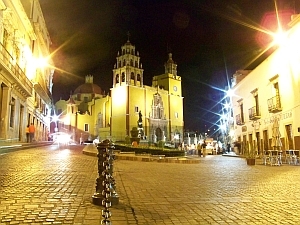 The Guanajuato tour will all be done on foot around the central UNESCO World Heritage historic district. Sure, you could parade around the city drinking non-alcoholic fake juice with some musicians dressed like Spaniards, or you could hit the bars of a Mexican city with someone who knows where to go and what to drink. Join us for a fun, relaxed tour of the winding streets and back alleys of this colonial gem of a city. Eat your way around Guanajuato! 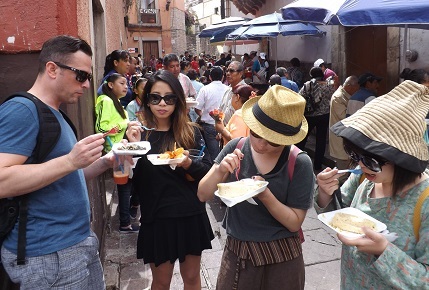 The original Guanajuato food tour, established in 2014. Tour the food stalls, the markets, and the sites of a unique colonial Mexican city with your experienced home town guide. Eat where the locals eat in the daytime on a walking city tour of Guanajuato, a UNESCO World Heritage city. Don’t be fooled by copycat tours – book with the best! Along the way on your walking tour of Guanajuato you’ll learn about the history and key sites in the city, ride a funicular train, and walk the pedestrian-only “callejon” back alleys of the city. See why more than 200 groups have come away talking about the great time they had on our Guanajuato tour. Founder Tim Leffel is a full-time travel writer, editor, and author from the USA who has published articles from around the world. He has a home in Guanajuato and has lived there for years. Our bilingual local guides trade off doing the tours now for groups from around the world. See more on the Your Guide page. Tours range from US$24 to $34 per person depending on group size and current exchange rates. This includes all food, walking tour guidance around the city, and a funicular train ride to a panoramic viewpoint (daytime Guanajuato food tour only). See more on the street food tour pricing page. Looking for a historic walking tour that doesn’t involve street stalls? Check out our sister company Guanajuato Walking Tours, where 3-hour tours are provide an in-depth look at the history of this important colonial city. Unless your group requires otherwise, day tours run for at least three hours starting at 9:30 a.m. The whole tour is done on foot and requires the ability to walk on uneven surfaces. Night tours usually meet up at 7:00 p.m. You must pay a 10% deposit in advance by Paypal or credit card at least two days in advance then the rest on the day of the tour in cash. We need at least two people to run a tour and all tours must be booked at least two days in advance. See more on the Prices and Booking page.